Make several of these at once for a party or your home! 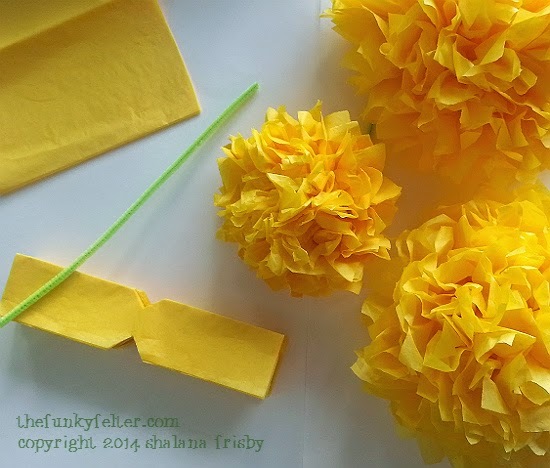 I've seen these beautiful and bright tissue paper flowers floating around the web on Pinterest and other places for a long while now. When I worked as a craft editor, I even made some for a photo shoot and magazine tutorial, but I had yet to make any for myself. Recently I decorated a school bulletin board and used these big, bold yellow flowers as part of the scene. These are not only cheap and easy, but quite fun to sit and make. 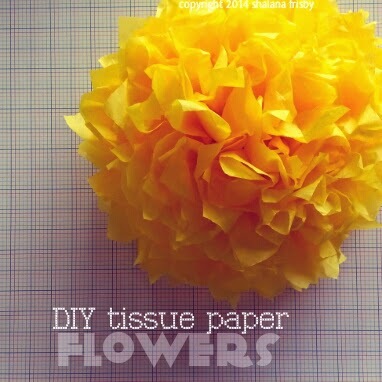 And, you can craft several at once for an entire paper flower bouquet. 1. Using a packet of tissue papers, unfold the packet and cut it into 2-3 strips lengthwise. One packet can easily make a few flowers depending on how large you'd like them to be. About 6-8 sheets stacked (or approximately one small dollar packet of tissue papers) makes a fluffier flower, more sheets stacked makes the flower dense and not quite as pretty in my opinion. 4. Now wrap the center of the pipe cleaner a couple times around the center of the folded tissue paper in between the cut notches. Then twist the pipe cleaner very tightly to secure it all in place. 5. Finally turn the secured stack on its side and fan out the accordion folds. Gently open up the folds and pull the paper layers toward the center to shape the flower petals. The delicate tissue paper very easily rips so be careful! Thankfully they are easy to make if you mess up one or two in the process (which I have done on more than one occasion!). Need sweet decorating ideas for these colorful flowers now that you've made up a bunch? 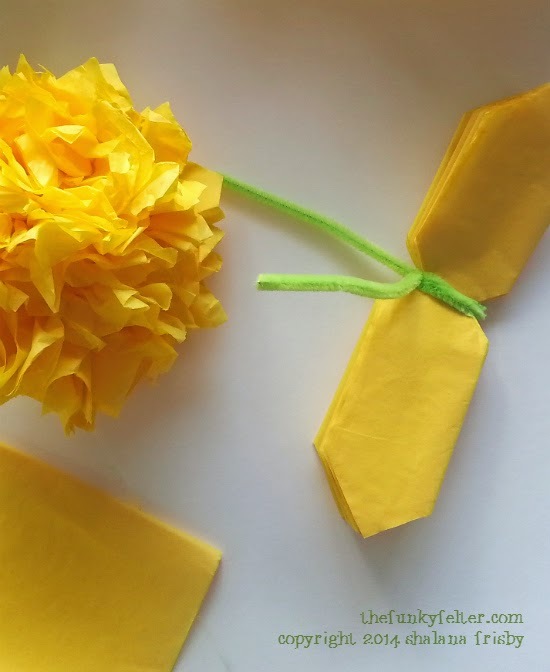 Well, come on over and check out my Pinterest Tissue Paper Decorating board. There's lots and lots of neat ways to use them as well as other photo craft tutorials on how to make them in all shapes and sizes. Okay, so I'm a little obsessed with these right now!